She's just 11 years-old, but Sidney Bates of Harrison Township is working hard to help give animals a better life. The Middle School Central 6th grader started a donation drive called 'For the Love of Pets'. It's now in its second year. 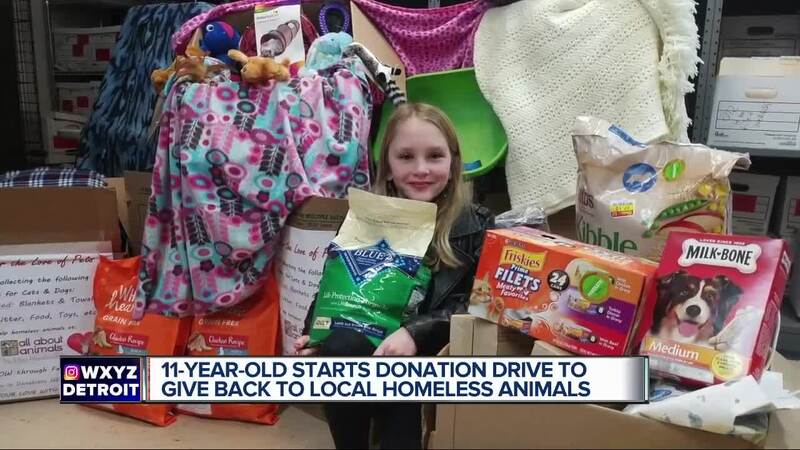 HARRISON TOWNSHIP, Mich. (WXYZ) — She's just 11 years old, but Sidney Bates of Harrison Township is working hard to help give animals a better life. The Middle School Central 6th grader started a donation drive called 'For the Love of Pets'. It's now in its second year. "I've been asking people for blankets towels canned cat and dog food.. and food of any kind and treatsof any kind," she says. The donations will be collected at Kroger on Crocker in Harrison Township. They'll go to the non-profit 'All About Animals' in Warren. They spay, neuter and help find homes for animals. Sidney and her family have helped several feral cats in their neighborhood. "I've always loved animals they should be helped...they should live as good as we do," says Sidney. "We saw that these animals were cold and hungry and wet, wanted to make sure more weren't created and wanted to be sure the ones that were there weren't struggling so much," says Sidney's mom, Gretchen Bates. If you'd like to help Sidney's efforts, donations can be dropped off between Thursday, February 7th through the end of the month.